Dewey Tomko is a professional poker player who was born on December 31, 1946 in Glassport, Pennsylvania. Dewey started playing poker in Pittsburgh pool halls, and he quickly became a consistent winner. Dewey used his winnings to finance his education. Dewey Tomko became a kindergarten teacher, but still played poker every night, oftentimes getting no sleep at all. He quit his job as a teacher when he realized that he was making more money playing poker. Dewey Tomko started playing in the World Series of Poker in 1974 and holds the record for most World Series of Poker appearances. 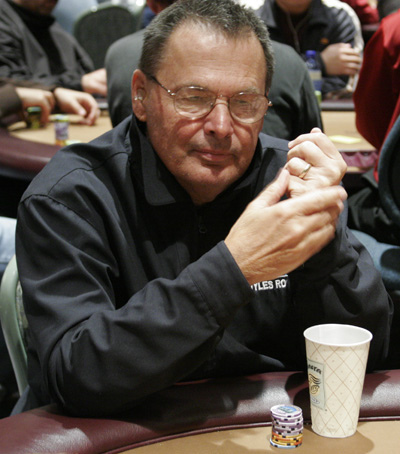 Dewey Tomko won his first bracelet in the 1979 World Series of Poker playing No Limit Texas Holdem. In 1984 Dewey won his second and his third WSOP bracelets, playing in Pot Limit Omaha event and Deuce to Seven Triple Draw. Dewey Tomko has made two World Poker Tour final tables, but did not win either of them. In 2005, Dewey had a third place finish in the WSOP Deuce to Seven Triple Draw event. Still, Dewey’s most famous poker accomplishments are his two second-place finishes in the World Series of Poker Main Event. In 1982 he finished second to Jack Straus and in 2001 he finished second to Carlos Mortensen. Dewey’s son Derek, is also a professional poker player. Dewey now lives in Winter Haven, Florida with his family. Dewey has earned nearly $4 million in tournament winnings.